Dan Alvez has joined Bristol South. Brian Carter is now a member of Cheltenham North. Evesham welcomed Graeme Calder, Ian De Paris and Valerie Larner. Janet Bartlett, Sheila King and David Homer have all joined Nailsworth. Great to have them all as fellow Rotarians. Clubs in Georgia, USA are inviting applications from young people aged between 18 and 25 for a 9 month study programme at a university or college there. Our Group Study Exchange Team led by Steve Davies are in North Carolina and seems to have been very well received. Their presentation to the District's conference received no less than four standing ovations and team members appeared on a local radio station. Find out more via their blog. Well done to Steve and the team. We are very proud of you. Cheltenham has more than its share of festivals. The Festival of Rotary is another one to add to that list. Masterminded by Allan Berry, local Clubs came together to positively & colourfully promote Rotary and membership to the many passers by. A huge variety of very impressive activities were on display including poetry reading by the e-Club. The 2014 Festival will be in Worcester. Cirencester are the latest of many Clubs in District 1100 to support this innovative charity partnering with link Clubs in Ireland and USA to provide 50 barrels each for projects in Romania and Sierra Leone. 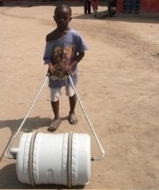 It costs just £30 per barrel which makes it so much easier for desperate people to access clean fresh water. The Roll Out The Barrel charity are currently looking for volunteers to help them raise their profile even further. This is a very simple solution to a very pressing problem so please help if you can. Tim Mason and the eClub members are storming ahead with creating a Rotaract Hub for young people aged 18 - 30. The eClub are also seeking entries for a young writers competition with the theme of "13". 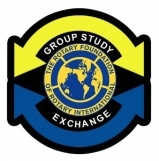 A short term Youth Exchange opportunity in Bhopal, India is on offer. Contact Gill Rogers to find out more. On 13 June there is an opportunity to go behind the scenes of our District's Rotary Youth Leadership Awards course. The District Skittles finals are taking place on 10 May at the Slimbridge and District Social Club. Challenge Cup – Gloucester v Dursley. Plate – North Cotswolds v Clevedon. Boules league is underway with 38 Clubs taking part. 11 Clubs have entered the bowls competition. Peter Holl would welcome contact from anyone who knows where the trophy is please. Well done to Monmouth as another impressive load of 22 bales of baby clothes has been sent to Romania and Moldova. Whilst other districts are still training their delivery teams for Club Visioning, we have already successfully delivered Club Visioning to 3 Clubs. It's about helping all members - not just the vociferous few, to think through their needs to develop a clear plan for the future. Visioning reminds members of the reasons for being in Rotary, and what wonderful opportunities there are for service within our communities. This enewesletter is sent to current Club Presidents and Secretaries. Please forward on to the rest of our Club's members especially the incoming President and his or her team. Copyright © *2013* *Rotary District 1100*, All rights reserved.